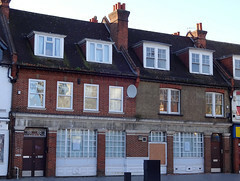 Business premises on South End, vacant as of December 2015. Still vacant as of September 2016, March 2017, October 2017, and February 2019. It was previously a branch of Lloyds Bank photo, but this closed down some time between April and December 2015. It was previously branded as Lloyds TSB photo, but rebranded to Lloyds Bank in 2013 along with other branches. Last edited 2019-02-07 14:53:02 (version 16; diff). List all versions. Page last edited 2019-02-07 14:53:02 (version 16).